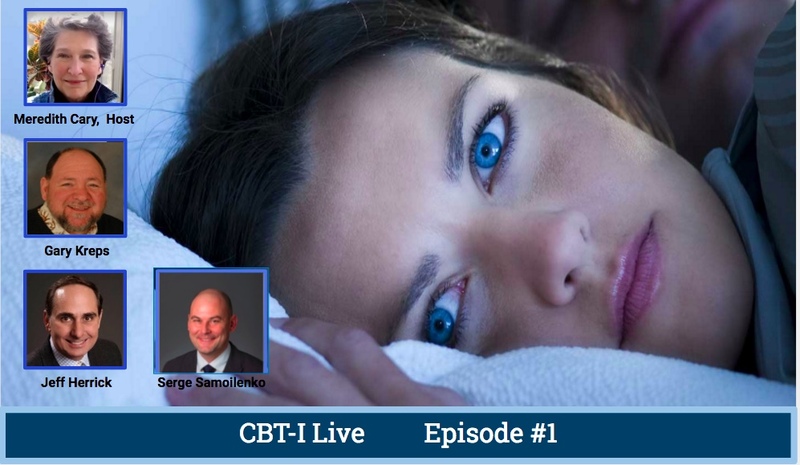 Tens of millions in the U.S. struggle with insomnia and yet few doctors refer to CBT-I (Cognitive Behavioral Therapy for Insomnia), a behavioral therapy that the American College of Physicians says should be the first-line treatment. 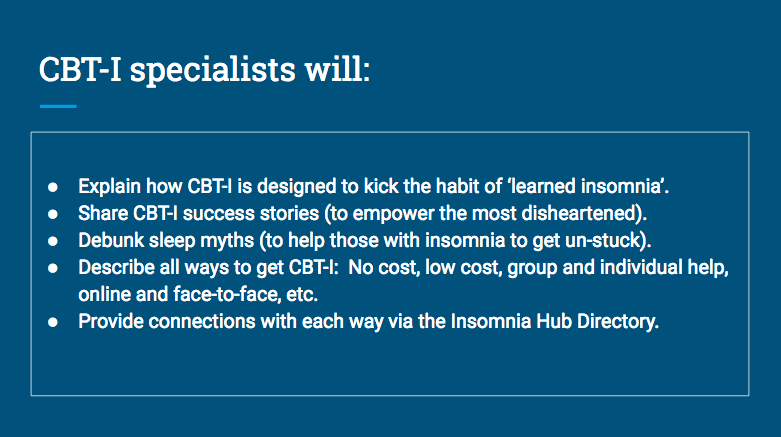 Our online streaming chats will feature CBT-I specialists who will share all the ways to get affordable, accessible CBT-I - anywhere. This introductory episode explains how we hope to go forward with future shows. What will we chat about? Meredith Cary, the host, will chat with clinicians, researchers, educators, and students from multiple disciplines … from among civilians & the military, non-profits & for-profits, and from professional sleep societies and associations. 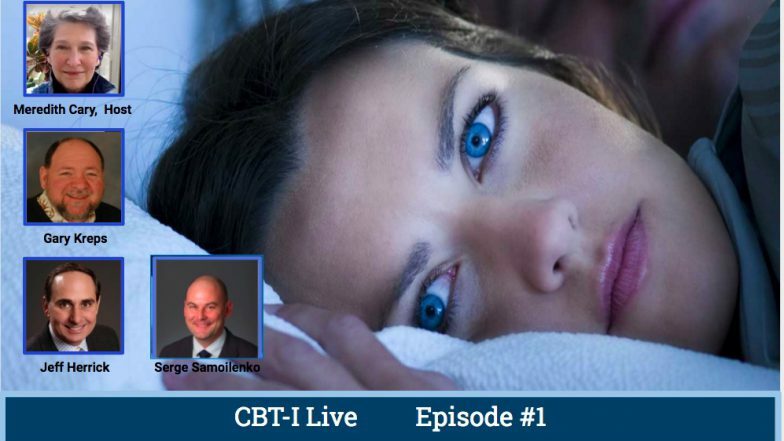 The American College of Physicians recommends that 100% of adults with chronic insomnia should initially be referred to CBT-I. But, if CBT-I providers aren’t visible and don’t share what we know about it or where to find it, physicians don’t know to whom or where to refer patients. Perhaps, if we ALL share together in one common place, we might increase consumer demand for CBT-I and reduce the over-prescribing of addictive drugs. This non-profit, curated and crowdsourced CBT-I Live ‘show’ can become one common ‘digital bridge‘ to which physicians can refer their patients. And, the Hub Directory can become one common (free) repository of all CBT-I providers’ profiles. We hope that healthcare consumers and professionals alike will share in and spread the word about our shows. Educators, we especially hope you will consider helping us develop the ONE Social Practicum. Comment on this post: Anyone can ‘comment’ below; Your name/email is required; Your email address is NOT made public. Ask a question during a show: Use the ‘comment’ field in this post. Subscribe to CBT-I Live: Anyone who comments is automatically subscribed to announcements for next shows. Enter your profile in the Hub Directory: Contact us at insomniaonair@gmail.com to request a profile. Suggest a guest (or self-refer) for the show: Contact us at insomniaonair@gmail.com to make a show suggestion. Partner with Share CBT-I: Contact us at insomniaonair@gmail.com to discuss a variety of ways to partner. Sponsor us: Contact us at insomniaonair@gmail.com to discuss ideas for sponsoring the show. 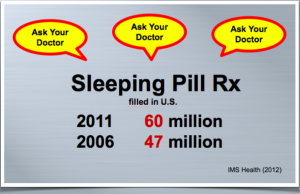 In part, over-prescribing is due to the intense consumer demand created by the ‘Ask your doctor’ ad campaign. To help promote consumer demand for CBT-I, we deeply appreciate the efforts of our partners who are engaging in the ongoing course-based Share CBT-I health communication campaign. Sergei Samoilenko and his Advanced Principles of PR class are currently testing a social media campaign to promote CBT-I Live. Distinguished Professor Gary Kreps and his Health Communication class is conducting formative research to study the needs of primary care providers to help determine how best to develop CBT-I Live as a digital bridge from primary care to the community. Educators … Please ask how your course might engage in interprofessional healthcare service-learning projects with us. Thousands die from sleep deprivation-related accidents. Too many of our loved ones are needlessly lost in drowsy driving crashes (50% are 25 years old or under). As well, commonly prescribed sleeping pills – benzodiazapines (like Xanax) or sedative hypnotics (like Ambien) – are addictive, among other bad side effects. 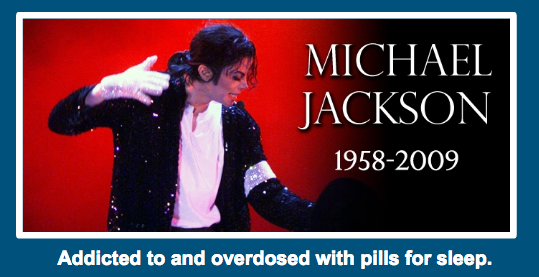 Desperate for sleep, Michael Jackson accidentally overdosed – aided by two different ‘benzos’ in his system. How can we share CBT-I together, to build a culture that values healthy sleep habits … not pills … to prevent more needless tragedies? Catalyst of and collaborator with interdisciplinary George Mason University team that is developing Share CBT-I … an ongoing, course-based health communication campaign to create a ‘digital bridge’ between healthcare professionals and consumers to provide open access to knowledge about ‘what works’ for insomnia and where to find it. Gary L. Kreps is a University Distinguished Professor of the Department of Communication at George Mason University. He teaches undergraduate and graduate courses in Communication Research, Health Communication, Organizational Communication, Consumer-Provider Health Communication, Health Communication Campaigns, and E-Health Communication. Dr. Herrick is an exercise physiologist with extensive experience in analyzing biological mechanisms underlying cardiopulmonary responses in a wide range of clinical populations. He is presently doing research on Obstructive Sleep Apnea and Muscle Fatigue.